Even with a dip in April U.S. sales, Mercedes remains in first place among luxury brands year to date, followed by BMW (97,317) and Lexus (85,853). 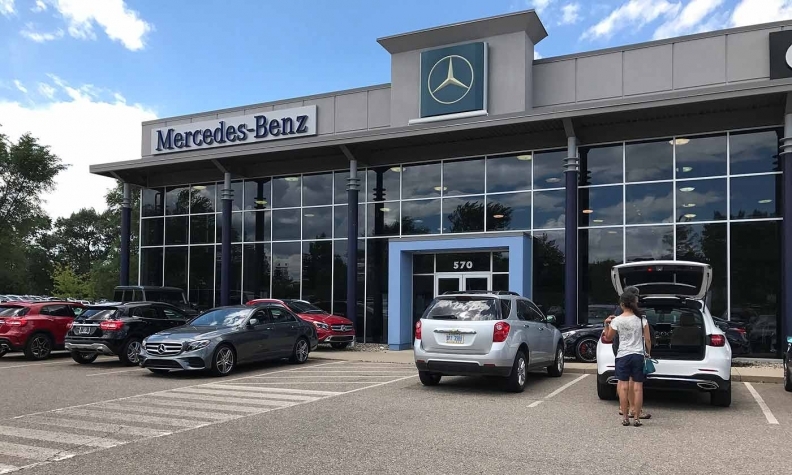 Mercedes-Benz USA, propelled by strong demand for SUVs, topped the luxury U.S. sales race in April and continues to outpace its nearest rivals, No. 2 BMW and No. 3 Lexus, year to date. Mercedes' U.S. sales inched 1 percent higher in April to 27,207, excluding the brand's commercial van sales. U.S. sales at Mercedes for January through April dipped 0.4 percent to 105,681 from a year ago. BMW sales rose 3.8 percent in April to 23,482, while Lexus volume dipped 2.1 percent to 21,642. Rounding out the luxury segment's top five brands in April U.S. sales were Audi, with sales of 19,104, up 2.1 percent; and Acura, with deliveries of 11,888, down 16 percent. Even with a dip in volume, Mercedes remains in first place among luxury brands year to date, followed by BMW (97,317) and Lexus (85,853). Mercedes-Benz' volume leaders in April were the GLC, C class and GLE. The GLC took the lead in April with U.S. sales of 5,853, followed by C class deliveries of 5,148. The GLE rounded out the top three with 4,110 units sold. "April sales are leading us into a solid second quarter," Mercedes-Benz USA CEO Dietmar Exler said in a statement. "We continue to see strong demand for our SUVs, and our increasingly diverse product lineup will continue this momentum as we enter into the summer months." Porsche Cars North America Inc. reported April U.S. sales of 5,570 -- a monthly retail record -- and a 0.7 percent gain over April 2017. Retail sales for January through April rose 7 percent to 19,524 vehicles. "The Porsche mix of two- and four-door sports cars is getting a broad welcome from customers," Porsche Cars North America CEO Klaus Zellmer said in a statement. "We see this in the strong April demand that crosses model lines." April growth leaders were the 718 Cayman, up 67 percent year-over-year, and the Macan, which gained 33 percent from April 2017. Total U.S. luxury sales dipped 2.2 percent in April, excluding Cadillac's results. And for the year, deliveries of luxury brands are up 1.3 percent, excluding Cadillac. General Motors is now releasing quarterly U.S. sales results, rather than monthly, for Cadillac and its other core brands, Chevrolet, GMC and Buick. Overall, the luxury market is outperforming the total U.S. light-vehicle market, which slipped an estimated 4.8 percent in April but is up 0.2 percent year to date.